Geragos: "This is not the lottery. This is this man's life." CNN's Gary Tuchman reports on Michael Jackson's defense attorneys going on the offensive. 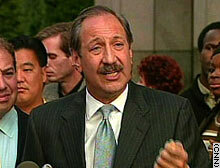 Attorney Mark Geragos vows action after revelations that he and Michael Jackson were secretly videotaped. CNN's Miguel Marquez on the boy accusing Jackson -- he appeared in a documentary with the singer. LOS ANGELES, California (CNN) -- Mark Geragos, lawyer for pop singer Michael Jackson, obtained a temporary restraining order Tuesday against a charter airline that he said secretly videotaped Jackson and him talking on board one of its planes and shopped the tapes to media outlets. Jackson spokesman Stuart Backerman said the tapes were made Thursday while Geragos and the singer flew from Las Vegas, Nevada, to Santa Barbara, California, where Jackson surrendered to authorities on suspicion of child molestation and was released on $3 million bond. The restraining order issued by Los Angeles Superior Court Judge David Yaffe prohibits XtraJet, the airline Geragos said placed the cameras aboard the plane, from releasing the tapes until a hearing in December on a permanent injunction, according to a statement from Backerman. Geragos told reporters he also had filed suit against XtraJet and reserved the right to sue anyone connected with making or trying to sell the tapes. A man who answered XtraJet's reservation line said the company had "no comment to make at this time." The Los Angeles Times quoted an XtraJet official as saying, "We explored the opportunity as any business person would." Sources familiar with the situation said the FBI had the videotapes and was evaluating their content. Matthew McLaughlin, an FBI spokesman in Los Angeles, said only that agents were at XtraJet earlier Tuesday and the agency was "evaluating whether any federal laws were broken." Geragos called the alleged taping "one of the most outrageous acts I've ever seen in my 20 years of practicing criminal law," and said he believes recording attorney-client conversations violates federal and state law. Jackson denies the molestation allegations, and Geragos warned anyone trying to capitalize on Jackson's current troubles. "Michael Jackson is not going to be abused. Michael Jackson is not going to be slammed, is not going to be a pi�ata for every person who has financial motives," Geragos said. Geragos quoted the lawyer for the charter company as saying, " 'We had a lottery ticket, and we thought we were going to do something with it.' "
"This is not the lottery. This is this man's life. This is his family's life," Geragos said. "We will land on you like a ton of bricks ... if you do anything to besmirch this man's reputation, anything to intrude on his privacy in any way." Addressing the child molestation allegations against Jackson, Geragos said, "If anybody doesn't think ... that the true motivation of these charges and these allegations is anything but money, and the seeking of money, then they're living in their own Neverland," referring to Jackson's ranch. In a related development, sources told CNN that detectives from the Santa Barbara County Sheriff's Department searched the home of Jackson's videographer last week, along with the Beverly Hills office of a private detective hired by Jackson. Formal charges will not be filed before mid-December, a source close to the investigation said. 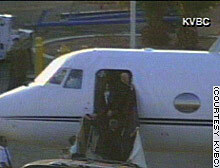 Michael Jackson gets off a charter jet in Las Vegas, Nevada, last Thursday, where he returned after flying to Santa Barbara to answer the arrest warrant. Jackson's accuser participated in a documentary about the pop star, a source close to the child's family told CNN. Investigators also have begun checking almost 70 calls from people claiming to have information about the investigation. "Those calls need to be screened, and we haven't been able to substantiate all of them as actual tips," a law enforcement source said, noting that "of course you have to figure some may be nuts." The source said documents in the Jackson case that can be released to the public are likely to be posted on a Sheriff's Department Web site, even though the department is having trouble keeping up with the Web traffic the case has generated. The department posted Jackson's booking photo on its Web site and soon had counted millions of hits. The site crashed, and the photo had to be moved to a server dedicated to visitors trying to see the photo.